I decided to dig through the archives for today’s photograph. I have a mountain of pictures that not only haven’t been published, but have almost been forgotten. I like to sift through old files, look back on all the faces and scenery I’ve been blessed enough to photograph. When my motivation is languishing – when I’m feeling the impulse to create something but don’t know where to begin – going through old photographs always helps. One of my favorite places in the whole world is the hilltop that overlooks Brewery Gulch and all of Old Bisbee. That old Arizona town is unspeakably picturesque. Years ago, I’ve been told, a local man – I wish I could recall his name – could be seen hauling materials, an armload at a time, up and down the rocky path that winds up the hill. And anybody who visits Bisbee eventually sees the big white cross on the hill. Most folks aren’t able to find the trail without being shown the way. Local folks have added their own candles, keepsakes, statues, prayer flags and vials of water. A local woman placed her husband’s ashes up there. A small red dollhouse-sized memorial was fixed onto the hilltop when Derrick and Amy Ross – our Nowhere Man and Whiskey Girl – passed away a couple years ago. On the backside of the hill is a makeshift shrine for those who braved the desert heat in an attempt to cross into America. 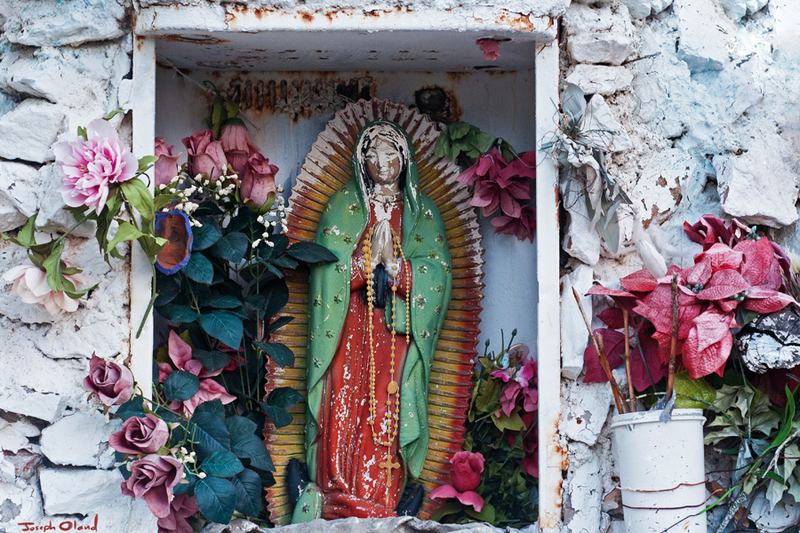 Toothbrushes, children’s shoes, baby bottles, rosaries, backpacks, sunglasses, and clothing have been collected and hung atop the rocks beneath the visage of the Guadalupe Virgin. I hiked up there several times a week, not often running into other people. I never grew tired of the view. Just thinking about it, I can almost feel the sense of calm in the wind in the summertime, watching monsoon storms roll in from the distance. It is a very special place. I look forward to being there again soon.